The focus may have been on the new manager, but the Merchandise Group at Derry City have also been working hard on securing new signings. The group are delighted to announce a partnership with Derry Nice Things, the local design firm. Derry Nice Things launched a range of DCFC related prints in 2017 and the two parties have now agreed that the club will stock these items both in the club’s online gift store and in store. 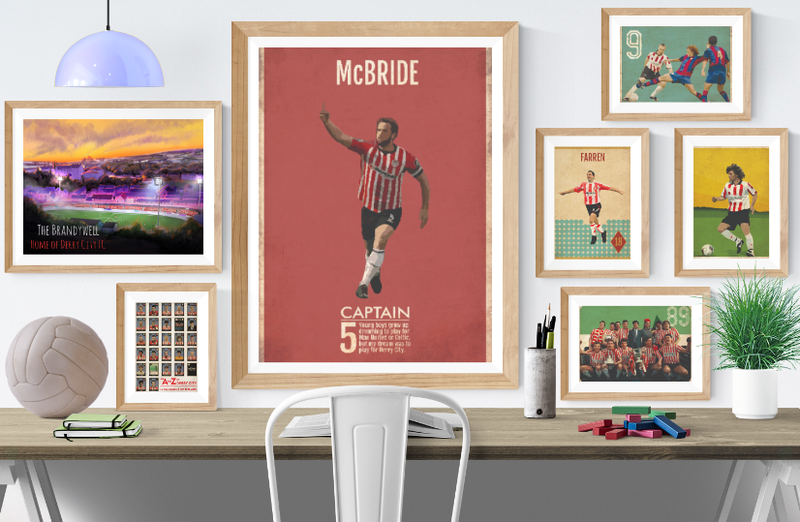 This offers City fans the chance to get their hands on some beautiful pieces on the club’s history as well as offering Derry Nice Things the chance to connect with the City fan-base across the world. The group have been trying to work with local firms where possible, and have partnered with the likes of Partridge Peartree and Merchandise Mania to provide items. We are delighted to be able to announce that we will be stocking the current range of prints online. We will be announcing details of our pop up store for Christmas 2018 in the near future and the prints will also be available for purchase here as well.